For every sound we can conceive there is a unique coordination of body movements that will produce that sound. In the act of playing, the vibrations resulting from these movements are received by the horn, amplified out the bell and resonate throughout the prevailing acoustic environment. Our sound conception, along with the coordinated movements of body, breath, and horn work synergistically to produce our personal horn sound. Ideally, when our sound conception is rich and clear, when our movements are free and efficient, when our instrument is of high quality and in excellent working condition, the resulting horn sound is free and sonorous. 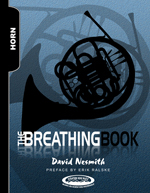 The horn, being a wind instrument, needs air flowing through it to produce sound. This air comes from our breath. Characteristically wind blows freely. Breath moving from our body through the instrument also needs to be free. It may be safe to say that much or most of our relationship with the horn revolves around learning how to be in consistent command of dynamic breath control. When we have this command, playing the horn is easy. Lacking freedom of breath control, playing becomes more effortful than necessary and our sound, technique, and musical expression are compromised. . .